Metalwork in zinc is our specialty. We have long experience in working with wrought iron, copper and custom wall style zinc range hoods. Based on years of experience and being number one manufacturer on the market our company become trustworthy metal furniture producer in the US and beyond. Among other home products, we fabricate sinks, tables and made-to-order counters for bathroom and kitchen. We provide many excellent design choices and can will discover them while browsing our rustic online store. 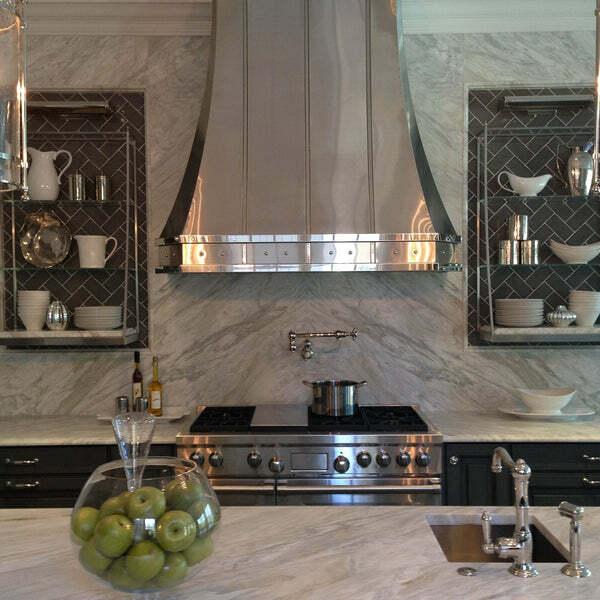 Custom wall range hoods are the ultimate trend in kitchen appliances. Take a look at a considerable selection of our custom range hoods and you will be able to see excellent quality from very modern to a farmhouse models. We have in offer, for instance, a very versatile "Chicago" hood decorated with hammered copper apron and straps. This design can be installed as wall mount or island and has three texture options. Those are smooth, hammered and distressed. You can further customize zinc range hood by choosing between three colors. Those are natural metal, dark or polished. The first appearance of zinc in its natural with bluish tone that gives a lot of elegance and brightness into kitchen. It corresponds well with modern metal appliances to give industrial look. In contrast hammered finish, will go perfectly well with rustic style. For an extra touch, you can add various metal straps. Add matching rivets for detail or select darker straps to bring more attention to the kitchen focal point. "Austin" vent hood impresses with its gently sloping edges blending together at the bottom with the hammered apron made of the same materiel. The hood design includes a crown molding that is usually attached to the ceiling. This hood is handcrafted in wall mount and kitchen island version. It can be used with both gas and electric stoves with ovens. Besides, the hood is available for any brand ventilating linear. We can prepare it for Broan, Vent-a-Hood or Kobe among other brands. If you require a making the hood ready for it, mark liner included. As a low cost option we offer our Mexican made hood vent linear incorporating 200CFM ventilators, light and filters. If you want to find other outdoor metal furnishings that will go well with your brand new custom hood, we would highly recommend our zinc table tops that are made of particle board with metal sheet covering it from the top, sides and little bid underneath. It makes the table safe to use as there are no sharp edges. Beside they can be supplied with various patinas just like the range hoods. They can have their surface smooth or hammered, natural or antique dark. You may consider installing a zinc kitchen sink. It will show typical for this material semi glass look. We produce them as drop-in, under-mount and apron style. Like all of our appliances, are durable and long lasting. We will work with you to produce a customized artifacts for your kitchen. To get started, click any of the custom range hoods styles from our collection. You can then click any item displayed to see pricing, customized dimensions and features. Delivery takes about a month. We offer free delivery of custom wall zinc range hoods to all mainland USA addresses.